Home / Asante Kotoko / Ghana Premier League / Gyamfi's Column / Songne Yacouba / Sports / Story of The Day / Song-ne Yacouba- Asante Kotoko's new song? 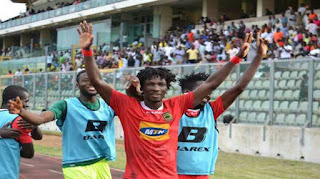 Song-ne Yacouba- Asante Kotoko's new song? In the world of football, every second on the field of play represents an opportunity for a new star to be born. Kumasi Asante Kotoko fans didn't have to wait till December 25th to see their new saviour. Hopefully, this messiah stays past the Easter period. Kotoko were on song last season till the departure of Coach Lugarasic after a string of bad performances necessitated his sack. Stop gap coaches came in but the ship still kept sinking until the arrival of Steve Polack from Berekum Chelsea. With a new breeze, he quickly found a saviour in Saddick Adams who joined the club upon his appointment. The lethal attacker scored 10 goals in 13 games after joining the club in the second period of the season helping them to lift the FA Cup. Plagued by injuries, Saddick fell off the pecking order under new trainer, Paa Kwasi Fabin. The good times didn't last! Saddick was finally cast out after just appearing once on the field after 12 league games. It's been a not-so-good start to the season and once more the club needed a hero. A new hero appeared shirted 31 being the 31st registered player for the club in the season. The French speaking attacker joined prior to the start of the season but only missed out mostly in the early parts due to a delay in the arrival of his International Transfer Certificate.
" I feel very good playing again, I thank God for the strength to function after staying off the pitch for about 6 months- Yacouba "
The former Etoile Filante attacker saw out his contract with Stade Malien before taking the move down south to Ghana. 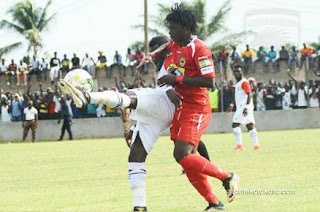 After close to half a year of inactivity, the attacker got his first taste of the Ghana league when he was given a start against Hearts of Oak on matchday 11 at the Babayara Stadium. Personally, it wasn't the dream debut as the Burkinabe who thrilled the crowd with his quick feet and dashes failed to find the much needed equaliser with minutes to spare for the home side. He got his head to the ball only to direct it high off the goal bar. Unperturbed, he went to Aiyinase where he scored his first goal for the club in the league in a 1-3 loss to Karela United. There and then, a new song was found! Left out of the squad that went on to defeat Bechem Utd by a goal to nothing at the Cape Coast Stadium due to illness, he bounced back to get his first home goal for the club against Elmina Sharks. Taking his first breathe on 10th June, 1992 in Bobo Dioulasso, the attacker started his professional football career in 2012 at home club Bobo Sport. Blessed with pace and trickery, he moved on to represent Etoile Filante and Stade Malien in the Champions League in 2015 and 2017 respectively. He was also an integral member of the Racing Club du Kadiogo side that won the Burkinabe Championship in 2015/16. Standing at 1.75m, the attacker has got the ability to play as a centre forward but functions well when he plays also as a second striker. His ability to find spaces behind defenders coupled with his delightful passing and zero fear for opposing players outlines his creative force. His anticipation and runs behind defenders are added qualities not so seen at the Babayara Stadium. With 2 goals in has last 2 games for the club, the sight of the attacker is a source of worry for most defences as he is blessed with a good leap in the air and an accurate right foot. Averaging a shot on target in his 3 games is not so audacious but with a shot at goal every 26 minutes, his stay in the league should be worthy. He is a dead ball specialist too and from 4 tries at the Babayara Stadium he has found the target twice but still yet to beat the goal line. Not so fine but not so bad a margin either. Having enjoyed some part of his career as a right winger, the attacker likes to press down defenders beginning the team's defence from the front. He always wants to play and by doing so he inevitable invites the other players to join play. With 3 caps for the Burkinabe national team, Asante Kotoko has a found a treasure. Not so sure how long they looked for him on the cave though. His presence like a magnet can pull out the best in the other players but only time can tell. Songne Yacouba, the new song in Kumasi?